Depart USC at 6:45 p.m.; return at 11:15 p.m.
To attend a performance on your own, visit geffenplayhouse.org to purchase tickets. 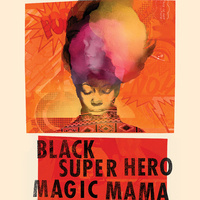 Black Super Hero Magic Mama by Inda Craig-Galván at the Geffen Playhouse begins Tuesday, March 5, 2019, and ends Sunday, April 14, 2019. *This trip is for current USC students only. You must use the provided transportation to participate. Space is limited and advance registration is required. RSVP beginning Thursday, February 28, at 9 a.m. Check-in for the event will begin at 6 p.m. on campus. Buses will depart at 6:45 p.m. and return to campus at 11:15 p.m. Dinner will be provided at check-in. When Sabrina’s fourteen-year-old son dies in a police shooting, it prompts a flurry of media attention and calls for racial justice. Crippled by grief, Sabrina retreats into the fantasy world of superheroes and archvillains that inhabit the comic book created by her son before his death. Assuming the role of Massai Angel rather than the expected part of grieving mother, Sabrina battles her enemies along the way to peace. Both heartbreaking and highly imaginative, this stunning world premiere marks the professional debut of Los Angeles–based playwright (and USC MFA playwriting alumnus) Inda Craig-Galván and signals the arrival of an exciting and distinctive new voice in American theatre. Admission is free and open to USC students only. Reservations required.